Don’t miss the most basic adoption event of the season! 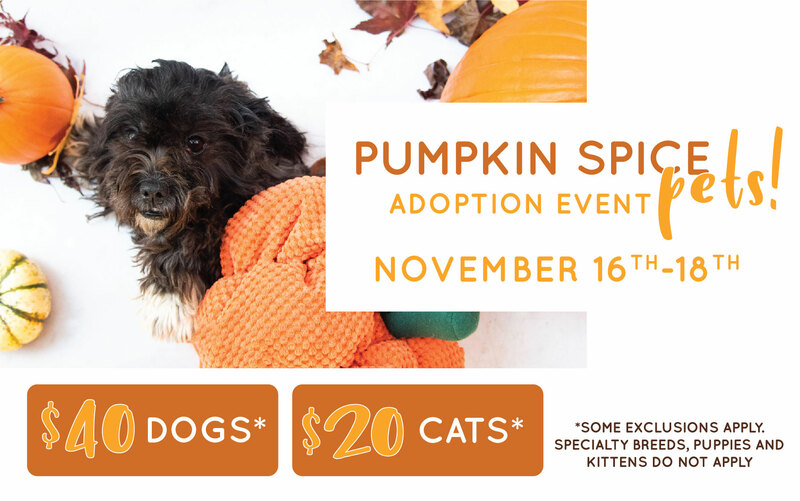 Join us this weekend for our Pumpkin Spice Pets adoption special at our three adoption centers. Dog adoptions will be $40 and adult cat adoptions are $20 during the special, which will run Friday, November 16th through Sunday, November 18th (some exclusions apply to the special). It’s the season of all of your fall favorites: pumpkin spice lattes, Ugg boots, sweaters and fall flowers (and this fall, a little bit of snow thrown in there). It’s time to add a new best friend into your life too! View all of our adoptables at www.kcpetproject.org or download our free mobile app. Get ‘Em Home KC Challenge Continues!